Located in Algiers and serving people throughout the Westbank of the Greater New Orleans metropolitan area, the Law Offices of Robert L. Marrero, L.L.C., focuses on bankruptcy, wills, probate, successions and select other legal concerns. Every client who turns to our firm receives dedicated personal attention from Robert L. Marrero, an attorney with 35 years of experience. We provide clear, honest counsel and skillful representation for hardworking individuals, families and business owners facing tough debt problems. Mr. Marrero will explain bankruptcy law and your rights under the law. We want to help you get the debt relief and fresh start you need. That includes helping you make the best possible decision for your future — whether or not that involves filing Chapter 7 or Chapter 13 bankruptcy. We also draft wills and other essential estate planning documents to help people protect their families and gain peace of mind. After the death of a family member, you will find the trustworthy legal guidance and representation you need to navigate the Louisiana probate and succession processes efficiently. Should an inheritance dispute or other problems arise, you will have a skilled, respected negotiator and proven litigator on your side. Anyone can suffer a major financial setback or pile up too much debt just trying to keep up with family expenses. The rights to protection from creditors and a fresh start through bankruptcy are the most powerful assets most people have when facing intense pressure from the banks and other financial giants. 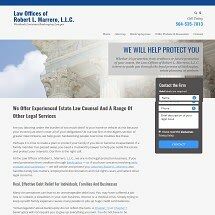 At the Law Offices of Robert L. Marrero, L.L.C., we are in the business of protection. We want to help you regain stability and hope for a brighter future. To sit down and talk things through with a lawyer you can trust, call 504-535-7813. We have presented continuing legal education programs for many bar associations on Bankruptcy related topics for over 15 years. As well as lecturing at Loyola University Law School on Bankruptcy Topics.